Power, instant access, connectivity, & collaboration define modern multipurpose spaces. From colleges to houses of worship to enterprises, organizations are putting one-trick ponies such as telepresence suites out to pasture as they look to get a bigger return on their AV investments. One reason is because a lot of expensive gear goes unused in single-purpose rooms, such as because employees are intimidated by complexity or because systems no longer fit the way they collaborate. A recent AV project installed by Sensory Technologies “The amortization of the room and all the technology in it needed to be fulfilled based upon eight hours per day of utilization, and rarely that was the case,” said David Moss, ClearOne vice president of media collaboration. “For example, the room might be booked eight hours per day, but the expensive videoconferencing system might only be used three hours per week. Not a good ROI model. 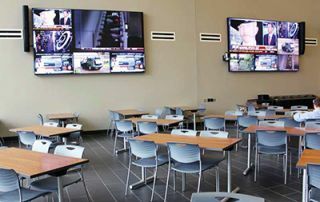 Multipurpose rooms help maximize ROI by spreading AV and IT technology around a facility to maximize usage. Here are few tips to consider when coming up with multipurpose-room strategy. During the design stage, get input from every type of employee to see how they’re collaborating—and how they want to but currently can’t. What types of devices do they prefer? Tablets feeding projectors? Interactive whiteboards? Videoconferencing? Are most meetings an executive holding forth, or is there a lot of back and forth? If you’ll be using outside parties such as architects and AV integrators, include all of them as early as possible to avoid expensive change orders later. One common pitfall is putting meeting rooms on exterior walls to take in views. That design floods the room with light that often washes out displays and projectors, to the point that another $10,000 has to be found to pay for shades. Walls of windows also can produce temperature swings that force the HVAC system to run at a high rate, creating ambient noise that affects the mics’ ability to pick up speech. Multipurpose rooms frequently have furniture and AV gear that can be moved around to support a variety of collaboration types, from lunch-and-learns to board meetings to all-hands sessions. So look for furniture that’s designed to provide flexibility, including for huddle rooms: small spaces designed for impromptu, Starbucks-style collaboration. Although WiFi and other wireless technologies have cut a lot of cords, plenty remain, such as for power. Getting everyone’s input about how they want to connect to AV systems ensures that the finished rooms don’t wind up with cables that are unsightly and trip hazards. Some multipurpose rooms have all of their AV gear permanently installed. Others have only basics such as a few mics or even just network connectivity in the right spots, with displays, cameras and everything else wheeled in as needed. Often the choice comes down to budgets and use cases. Vendor portfolios reflect that preference. Microphones are key for effective collaboration in larger rooms, as well as smaller ones with remote participants. The better everyone can hear, the longer it takes for conferencing fatigue to set it. But when it comes to the type of mic, there’s no consensus. But others say that new audio technologies, such as beamforming, enable today’s ceiling mics to overcome limitations of just a generation ago. Another type of noise is interference from other wireless mics, whether they’re in adjacent rooms—such as when a multipurpose room is divisible via moveable walls—or from tenants in a multi-company building. One solution is to use a product, such as Revolabs’ Executive Elite, with has a built-in scanner that sniffs the airwaves to see what else is using that block of spectrum. Ideal for multi-use spaces, the AMX Enzo offers users the unique ability to access documents and presentation content in mere seconds rather than having to go through the obstacle course of powering up a PC, logging in, accessing the network, etc. And when your meeting is over, with Enzo, there’s no logging out, no system updating to wait on. All files are instantly purged, so there’s no chance of them being left on the machine or accessible to someone else. “You can go into the management interface to scan and pull a report to give you an idea about what the environment looks like,” said Tim Root, Revolabs CTO. Distributed antennas, such as those in Executive Elite, also minimize interference—and thus maximize the number of available channels—by keeping signals where they need to be. “You can dial down the transmission distance,” McGarry said. “You don’t have to go through walls. Another option is to use infrared mics, such as Media Vision’s TAIDEN HCS-5300 series. “That product makes up that one-third of our revenue in multipurpose spaces,” said Patrick Herlihy, Media Vision director of sales for North America. Regardless of the type of technology they use, wireless mics are worth considering because that’s one fewer set of wires to be a trip hazard or eyesore when a room is reconfigured. Years down the road, they also provide flexibility for accommodating meeting styles that weren’t envision when the space was designed. Multipurpose rooms often are more challenging from a design standpoint simply because they have to accommodate so many work styles and devices—including ones that haven’t been envisioned yet. But that doesn’t mean big tradeoffs are necessary. “Sometimes there may be a tendency to say, ‘It’s a multipurpose room, which means all uses are going to be somewhat compromised, so I’m not going to work as hard at getting it right,’” said Justin O’Connor, Biamp Systems audio product manager. Tim Kridel is a regular contributor to AV Technology magazine.